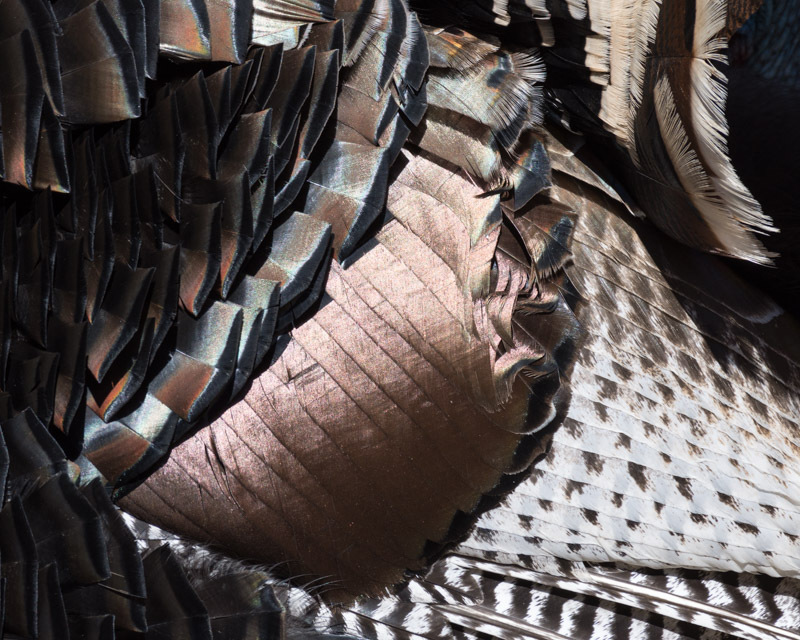 Gould’s Turkeys are a subspecies of wild turkeys found in Arizona (and New Mexico and Northern Mexico). They are found in the Catalinas at higher elevations than the Foothills and there is a large flock in the Santa Ritas that are commonly seen in Madera Canyon. I came across that group at the Santa Rita Lodge this week and was taken by the many colors on these birds. 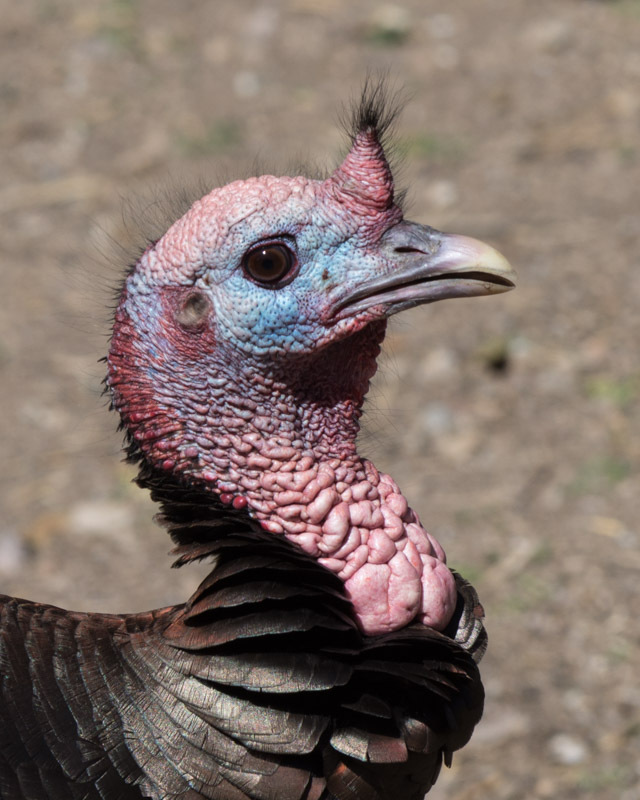 Besides the blues and pinks on the face of this young turkey, other facial features are striking. You can see its ear (which you can’t do on most birds). The crown or spike above its beak is called a “snood”. That sounds like the name of a pirate in Peter Pan! The snood will grow longer as this bird ages, eventually drooping down its face. Those pink, fleshy bumps on its head and throat are called “caruncles”. Caruncles and snood are two words that one doesn’t often hear. In this adult Tom, the snood has grown long enough to droop down its beak and onto its throat. The blue and red colors are brighter on this bird’s head and you can see some of the iridescent feathers on its back. 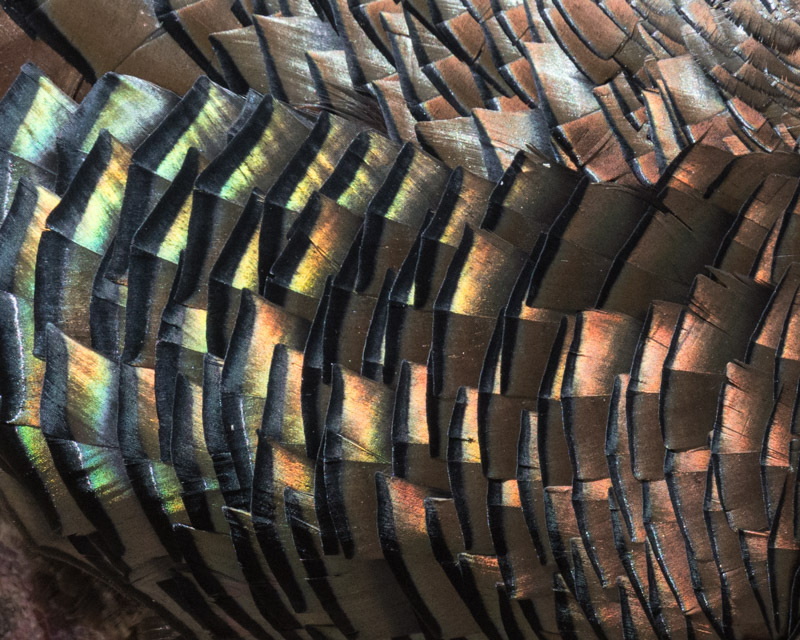 This male “Tom” turkey was feeding on seeds on the ground, and you can see the red, bronze, green and gold feathers on its back. I think it is interesting to see how each of its feathers have a squared end to them. A close-up of the side of one of the Toms. 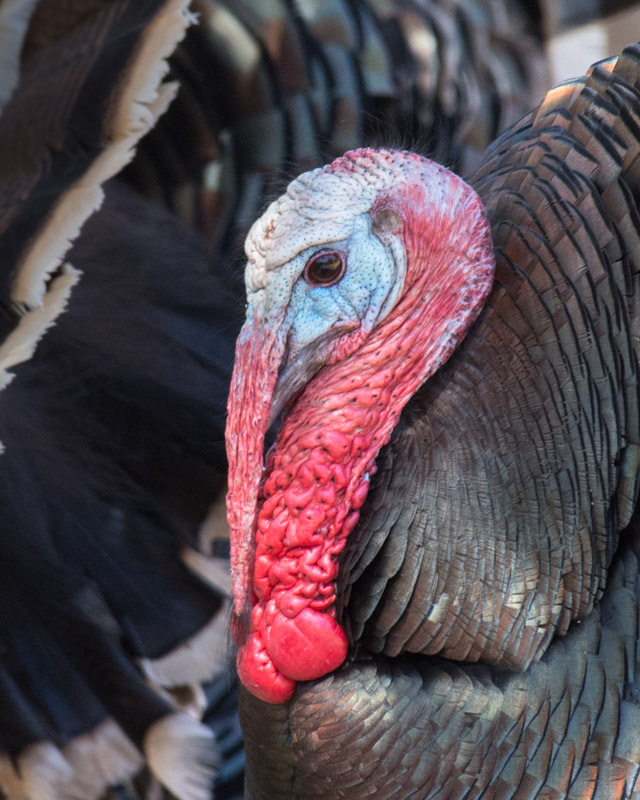 There are five subspecies of Turkeys in the United States. The most common in our area are the Gould’s Turkeys. 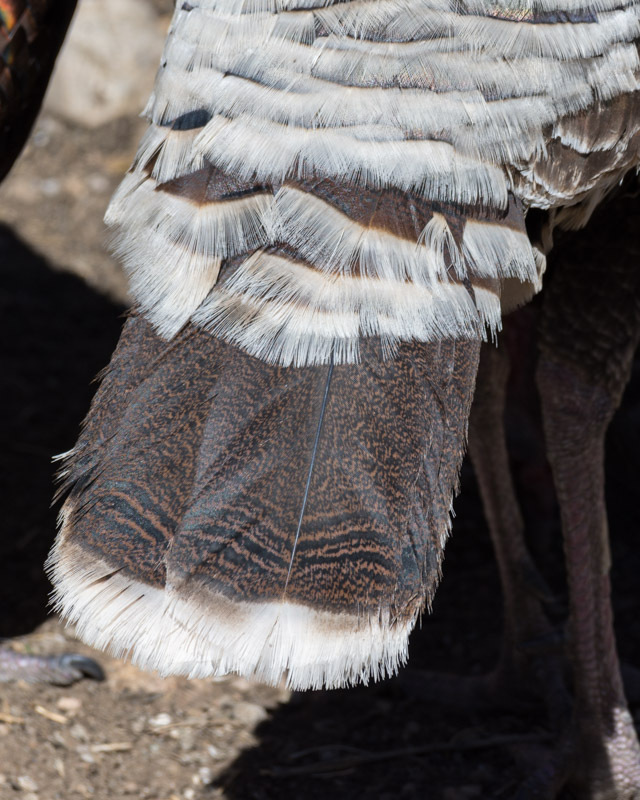 They can be distinguished from the Merriam’s Turkey by the Gould’s white-tipped tail feathers and white-ish edged rump feathers. 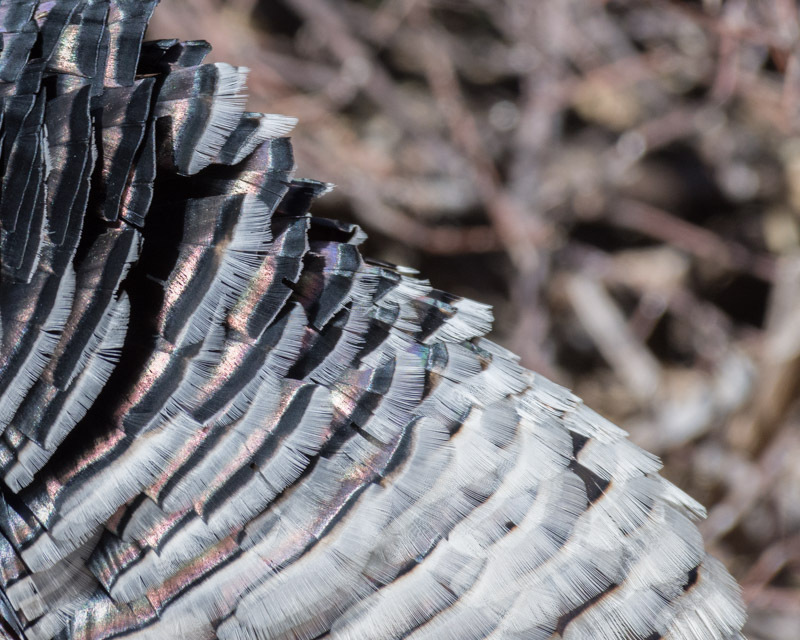 Merriam’s Turkeys are more often found in the higher elevations north of the Gila River while Gould’s are the more common turkeys in the Southern Arizona mountains (Catalinas, Santa Ritas, Huachucas and Chiricauhas). 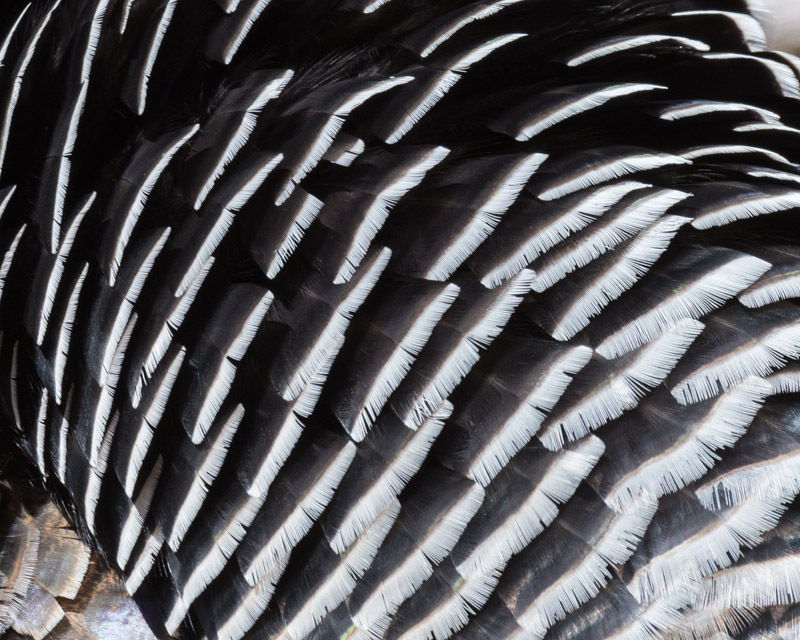 The white rump feathers with hints of copper in them. 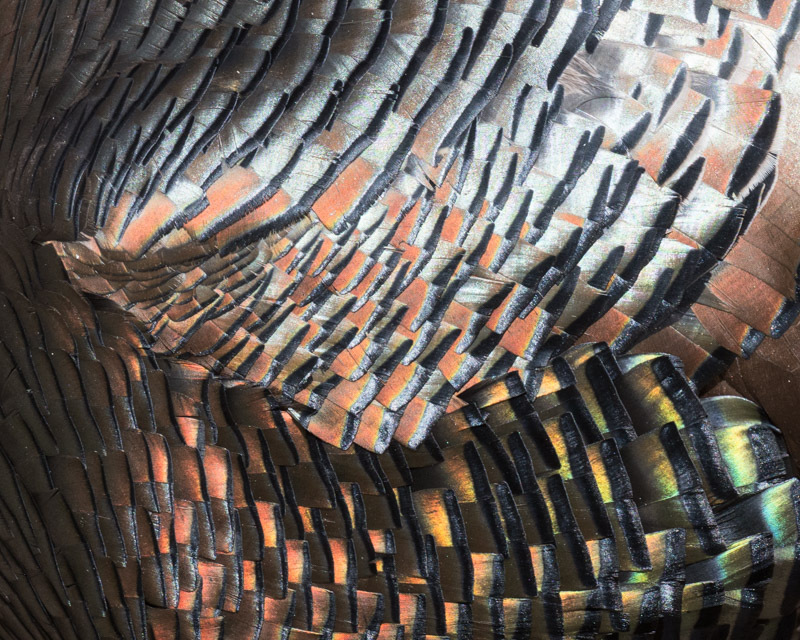 Male turkeys will display to attract a female. He’ll do this by puffing out his feathers, spreading his tail and dragging his wings. This is called strutting. 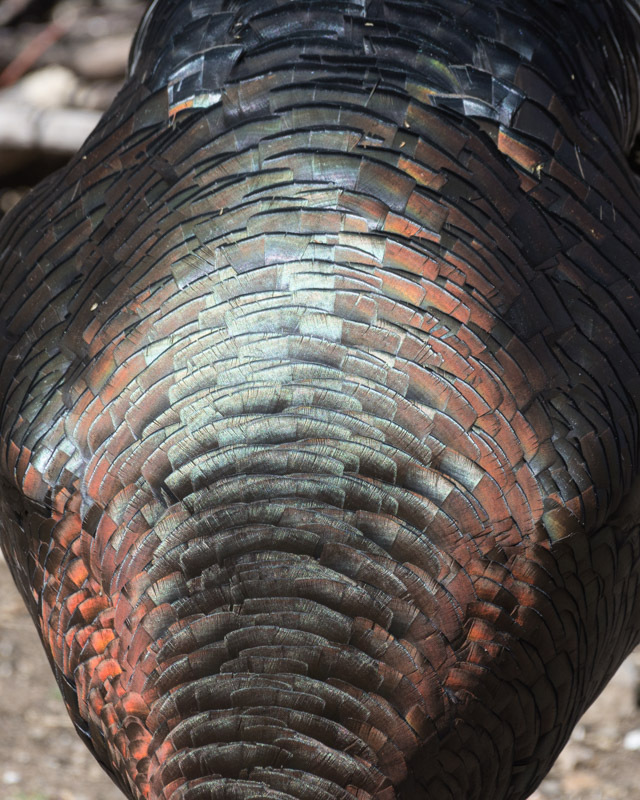 And the copper plate of feathers at his side in front of the tail. Turkeys are definitely beautiful birds! !